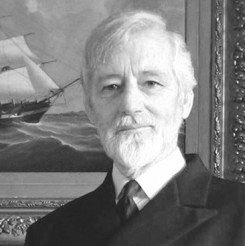 Richard Woodman is a prolific author of historical fiction, and was born in London in 1944. He became an indentured midshipman in cargo liners at the age of sixteen and has sailed in a variety of ships, serving from apprentice to captain. In 1978 he won the Marine Society's Harmer Award. This experience gives his naval fiction a rich authenticity, and spurred him to write over forty historical novels, as well as a series on the history of the British Merchant Navy, alongside many other non-fiction historical books.